Nusch Werchowska began classical piano studies at the conservatoire de Grenoble at the age of seven. Under the influence of Tchango dei (Archie Shepp pianist) she turned toward jazz and improvisation. From 1993 to 2001 she continued with music and dance improvisation courses led by Barre Phillips.Travelling between Brussels, Berlin, and France, she produced in this period countless collaborations with dancers: Bud Blumenthal, Pascale Gille, Patricia Keuypers, Claire Filmon, Nathalie Rinaldi, Julie Serpinet, Lou Sturm, Loulou Omer. 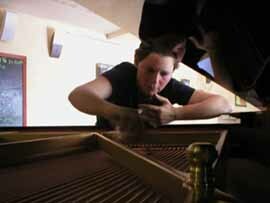 She performed a solo at Naxos Bobine,Paris,in 2005.She is working on a c-d solo for april 2006. She lives in Rennes and organised since 2003 "Les Rencontres ZieuMZic" ,a festival of improvised music that has featured artists such as Etienne Brunet, Sébastien Bouhana, Mathias Forge, Sébastien Cirotteau, Bertrand Gauguet, Christine Sehnaoui, Sharif Sehnaoui, Claude Saubole, Le Quan Ninh and Christine Wodraska. She played with Fréderic Galiay, Gilbert Roggi, Guillaume Roy, Sébastien Coste, Eddy Kowalski, Margrit Rieben, Anna Homler, Benjamin Bondonneau, Paul Hubweber, Mathieu Werchowski,Olivier Toulemonde,Mathias Forge, Fred Van Hove, Barre Phillips. She also organizes concerts with "Arts Mouvements Energies",and hosts workshops in her home.